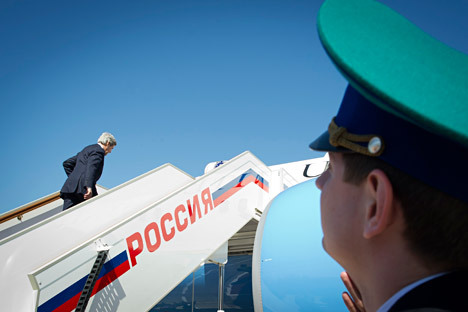 file-pool photo U.S. Secretary of State John Kerry boards his departure plane in Moscow, 2013. RBTH presents a selection of views from leading Russian media on international events, featuring reports on a possible visit to Moscow by U.S. Secretary of State John Kerry for talks on resolving the crisis in Syria, potential problems for the construction of the new U.S. embassy in Moscow due to sanctions against Turkey, and talks on using airports in Cyprus in the Russian campaign against ISIS. The Kommersant business daily reports that in the upcoming weeks U.S. Secretary of State John Kerry may visit Moscow to discuss the resolution of the conflict in Syria. The date of the visit remains to be fixed, according to a source. During a press briefing on Dec. 8, U.S. Department of State Spokesman John Kirby stated that, "there is still no certainty," yet he also did not deny the information about the visit. In the last few months the U.S. Secretary of State has met Russian Foreign Minister Sergei Lavrov on several occasions. The last time the ministers met was in Paris during the session of the OSCE Council of Foreign Ministers in Switzerland on Dec. 4. It was there that Kerry mentioned "a possible" visit to Moscow. In the event Kerry does come to Moscow, the main topic of discussion will be the situation in Syria, including an agreement on the list distinguishing moderate opposition groups in the country from terrorists. The daily broadsheet Izvestia reports that Russia's sanctions against Turkey, which will limit the work of Turkish companies starting on Jan. 1, 2016, may create serious difficulty for representatives of the U.S. State Department in Moscow. Turkish workers are working on the construction site of the new U.S. embassy building and may be taken off the project at the beginning of the new year. Contractual work is being carried out by one of Turkey's largest construction companies, Enka, which has been receiving commissions from the U.S. Embassy for a long time. It is also known for having reconstructed the State Duma and Russian governmental buildings in the 1990s. For the last 15 years the general contractor for the construction of practically all U.S. embassies around the world has been the American company Caddell Construction, which has worked steadily with Enka as a subcontractor. According to U.S. Embassy Spokesman Will Stevens, Caddell is now looking for a way out of the problem brought about by the Russian presidential decree of Nov. 28, 2015. "As far as we understand, Caddell is studying the effect of this new decree and its potential consequences on any type of construction work on the U.S. embassy (in Moscow – RBTH)," said Stevens. "The decree to impose sanctions could significantly affect the realization of the project," noted a source close to Enka. "First, this concerns visa problems for Enka employees, which they will encounter starting on Jan. 1, 2016." Vera Zimenkova, Corporate Client Director at the Colliers International consulting firm, agrees. "The embassy and its territories are recognized as a part of the country it represents, which is why officially the ban on doing construction work on this site will not be valid. Russian restrictions on Turkish constructors may influence the extension of working visas for the general contractor's employees," said Zimenkova. In accordance with the Presidential Decree of Nov. 28, starting on Jan. 1, 2016 Turkish companies, primarily construction firms, will have to obtain special permission for stipulating new contracts on Russian territory. The centrist newspaper Nezavisimaya Gazeta writes that the Republic of Cyprus is becoming actively engaged in the fight against extremists in Syria. Russian Ambassador to Cyprus Stanislav Osadchy said on Dec. 8 that Moscow is talking with Nicosia about obtaining the right to use Cypriot military facilities for conducting anti-terrorist operations against the Islamic State (ISIS) organization. In the ambassador's view, the sides will soon reach an agreement. Cypriot Foreign Minister Ioannis Kasoulides clarified that the talks between Moscow and Nicosia concern Cyprus permitting Russian airplanes participating in the Syrian campaign to land at certain Cypriot airports in the event of an emergency situation or for evacuating Russian citizens. The airport being discussed is located near the resort town of Paphos, writes Nezavisimaya Gazeta. A source from the Cypriot Foreign Ministry confirmed that the talks are being held at the level of foreign ministries and most probably Moscow will obtain permission to use the airports "in the event of an emergency situation or for humanitarian reasons." It is important to note that Russia is asking for the right to land its planes at Cypriot airports only in the event of emergency situations, writes the publication. France and Germany use an airbase on the island for fueling and technical maintenance, as well as for evacuating their citizens. The UK has directly activated its bases in Akrotiri and Dhekelia for carrying out air strikes on ISIS positions.